More than three years ago, Luciana announced on her now-defunct MySpace blog that she had “been cast as the lead in a feature film called Fast Track“, starring opposite Brian Austin Green and Jeffrey Combs. “Tuesday night at about 9pm my manager called me up and told me that I had been offered a role in this film, playing Brian Green’s wife and that it started shooting the next day! Wow! I accepted the offer and we are now filming. Since then, we have been treated to dozens of amazing stills by Michele K. Short, a couple trailers and previews have been released, the movie has been renamed as Urgency, it has been aired in several Asian countries, and there’s even one Western country where this indie thriller has been available for renting since last year – Australia. But, of course, the thing we really had been waiting for was the release of a regular DVD in Europe or America. And now the wait is finally over! In fact, Urgency hit the shelves in France last week. Meanwhile, the Region 1 release (America, Canada) is scheduled for March 15. No word on a UK or German DVD, yet, but I’m pretty there will be something later this year. You may order or pre-order the DVD via Amazon.ca, Amazon.com or Amazon.fr, respectively. Too bad neither of those covers features beautiful Luciana! She portrays Sofia, a homemaker living in LA with her loving husband, Tony West, a successful pharmaceutical executive (Brian Austin Green). …but after a day of tense negotiations with potential buyers, Tony comes home to find his wife missing – kidnapped – and the kidnappers demand he bring $50,000 to them within 90 minutes or she’s dead. Armed with only his wits and his cell phone, he has no choice but to comply. He soon realizes that this kidnapping is tied to information that he possesses, and people he knows are willing to kill him to get it. As he unravels more and more of the mystery, he realizes that the list of people he can trust is getting shorter and shorter. As time runs out, Tony must decide who is on his side, and who wants him dead (Regent). 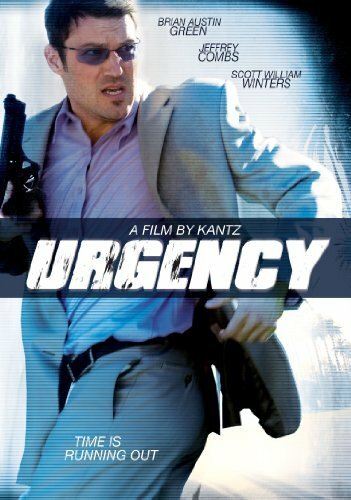 Written by Barry Louis and directed by Kantz, Urgency also stars Jeffrey Combs as Sumner Cavic, Chira E. Cassel as Janet, Scott William Winters as Canaan, John Colton as Edward and Sally Kirkland as Mediator. This entry was posted in Other and tagged DVD, Fast Track, Urgency. Bookmark the permalink.